Are Toyota’s Woes Good For America? My brother-in-law works for a company that makes machine parts for Detroit. The past few years have been brutal to his company. There was so little business, that my BIL only went to work three days a week and had to pick up a side job pumping out tax returns for H&R Block. 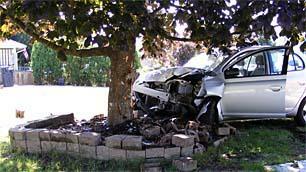 Then Toyotas started speeding up and not stopping until they met a tree. Who the hell is buying Toyotas now? Nobody. Americans have started buying American cars again. Detroit factories are all powered up and pumping out their own wrecks all night. My BIL is working six days a week. Will Toyota's woes re-ignite Detroit? Oh sure, Toyotas were mostly made in America in factories down south, but let's just ignore that fact right now. Matt, you are more trusting than I. Toyota problems almost always hit over-60s, uncontrolled acceleration problems hit other makes and are unreported. I am a conspiracy theorist here. Yes, it’s possible it’s good for Detroit. I just hope Detroit realizes that they still need to change their business model to resemble those of the Japanese car makers. If I had to buy a car right now, I’d shop Ford first for the whole non-bailout, non-imported combo. Of course, I don’t have to buy a car now and I’m hoping to wait until 2012. Given that two years ago, I was hoping to wait until 2010, the odds are pretty good we won’t get a car for longer than that. Speaking of political science, if it’s really true that GM’s success would benefit the diffuse interest of taxpayers now, instead of the concentrated, well-organized, and perennially influential interest of car company execs and owners, wouldn’t that make Congress less likely to investigate Toyota? GM’s success would primarily benefit retired or nearly retired autoworkers. If the benefits were more broadly shared, I wouldn’t mind the bailout nearly so much. We bought a Toyota shortly after the first recall stuff, and now I wish we’d waited a bit to get a better deal! I am pretty skeptical that the problem’s anything to fret about. The stats are about like the stats for child abduction, frankly, and are being reported about as responsibly. My brother lent me Car (http://www.amazon.com/Car-American-Workplace-Mary-Walton/dp/0393318613) to read, and I’m only partially through it, but there’s some interesting stuff buried in there about why consumers buy the cars they do, and what Toyota meant for Ford in the early 1990s. Reputation is supposed to be one of the reasons everyone bought Accords (and what the Taurus team was fighting against), but there’s a push for quality of a car too, spurred by the Camry. Perhaps I’m too cynical to be much surprised by the revelation that the physical qualities of a car weren’t too much of a design or purchasing decision. The frustrating thing about the Toyota issue, and I haven’t seen enough stats on the matter, is how people seem absolutely convinced it’s electronic. Or perhaps “the evil, thinking computer.” Why do people freak out so much when something’s programmed? Too much 2001 in the culture? I once drove a car that intermittently had a super-fast idle–accelerating past 30 mph without your foot on the gas. And that was just an engine problem. It’s not like I needed strange circuitry to get that sort of issue. I wonder if a problem in these cases, if it is driver error, might not be the decline of driver’s ed in schools. My high school district cancelled it the year after I took it as “elitist.” However, unlike my friends who learned from their parents, we were put through all sorts of situations and trained through them, including some rather frightening skids–however, as a result, I’ve never gone off the road in bad weather.